Scotland's only openly-trans councillor has said they are stepping back from frontline politics. 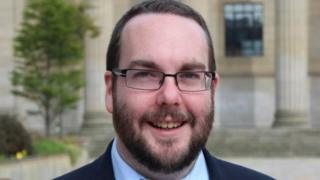 In a statement on social media, Dundee councillor Gregor Murray said mental wellbeing, personal issues and online abuse were behind the decision. The SNP councillor also said they had received threats to their life. They will remain a councillor but will no longer be convener of the children and families services committee or an equal opportunities spokesperson. Councillor Murray, who is gender non-binary and prefers the "they" pronoun, posted a letter to council leader John Alexander on Facebook, saying the last few months had been "extremely tough personally". The letter said: "As the only openly trans person elected in Scotland, it has not been easy dealing with the sustained and vindictive nature of some of the personal attacks and threats to my life that I have received over the past few months." The post continued: "My own mental wellbeing is not where it should be. As well as issues surrounding my personal life, I have also been subjected to a vicious and sustained string of abuse across various social media channels, a small fraction of which you have witnessed. "This has led me to make a number of wrong judgements in communicating with people who campaign against my fundamental human rights. "I have not handled this situation well in the slightest. I have used language that is inappropriate for someone in my position, which is causing an unnecessary distraction from the fantastic work that this administration is doing for the city." The councillor had been criticised for language they used in online rows with women's groups. They added: "The points that I have been trying to make have been lost due the ways in which I have expressed them, and I feel as though I am not being a helpful member of your administration or of the LGBTI community. "Therefore I believe it is in the best interests of the administration, my constituents, our party and my own health if I take a step back at this time, in order to resolve my own issues. "It has been an honour and a privilege to fulfil these roles for the past year, and I hope that the passion and positive contributions that I have brought will not be overshadowed by the circumstances in which I depart from them."